God has created an amazing world full of animals. Each animal is different. 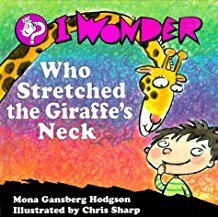 Have you ever wondered who stretched the giraffe’s neck? Jared asks this question and wonders about the answer. Can you guess what it is? In the I WONDER books, Jared uses his imagination as he explores God’s amazing world and flawless character. Children of all ages will love Mona’s whimsical and engaging text and Chris Sharp’s creative color illustrations. I Wonder Who Stretched the Giraffe’s Neck is especially designed for children ages 4 to 8.